Whether you are a student, whether you are an accounting teacher, whether you are an accountant or whether you are CA or CPA or have own business, there is no difference because every area, we have the pressure to get success. A student wants success in exams. An accounting teacher wants success by good performance of their students in exams. An accountant wants success in promotion and growth in salary. A CA or CPA want success through getting more and more clients. If you have business, your success meaning is more and more customers. So, everywhere we need success. Success can come from controlling the mind. If we can control our own mind, we can get success on whole world. A student will get success, if he will control his mind and focus on study. An accounting teacher will get success if he will focus to teach students properly. An accountant will get success if he or she will focus on the work by controlling his or her mind. A CA or CPA gets more and more client if he will control own mind and focus of mind on his action. A business person will get success in business if he will focus of his mind on the quality of products and getting better relationship with customers. So, everything is based on controlling of mind. Now, we have to think, how to control mind. Simple, mind is machine of thinking as you force. If you will give the food to mind of positive thinking. It will think always positive and make the habit of positive thinking. If you will give the food of negative thinking, it will think always about negative aspect of life. Now, we have to understand, how we can develop the positive thinking habit. It is very simple. Through positive attitude understanding and practice, we can make our positive thinking habit. It is clear you have biggest goal. If you are student, you have biggest goal to get 90% marks in exam. If you are teacher, you have the goal to help students to get 90%. If you are CA or CPA, you want Rs. 20,00,000 per month through your accounting and auditing service. If you are business, you are surely interested to get sale of Rs. 20 Crore per month. So, if you want, then you need to make positive mental attitude by writing it 50 times on the notebook and speak 50 time by writing each time. 1. I can do work hard for getting 90% marks in exam. I will do hard work for getting 90% marks in exam. 2. I can do work hard for giving help to students to get 90%. I will do work hard for giving help to students to get 90%. 3. I can do work hard in accounting and audit service for getting Rs. 20 Lakh per month. I will do work hard in accounting and audit service for getting Rs. 20 Lakh per month. 4. I can do work hard for getting Rs. 20 crore from customers per month. I will do work hard for getting Rs. 20 crore from customers per month. With this, your goal will be set in your mind and brain also. Work will be done and you will achieve because you have dream of it. What will you do for this. Just go to market and buy a blank notebook for this. I can Do this, I will Do this. As this a simple question to your parent why did they bear you? 1. Because we have need of you. 2. Because it is gift by god. 1. Answer is very clear. World is needed you that is the reason you are in this world. World is need Thomas Alva Edison because he had identified himself that he was important for finding electric bulb. He wrote and spoke that he came in this world for success not failure. So, he invented the electric bulb even after 10000 failure because he wrote and spoke it 50 times a day. 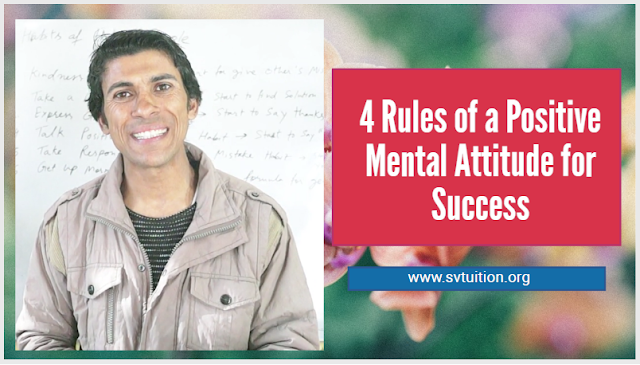 If you want same positive mental attitude for your success. Start to write and speak and see the magic of it. I came in this World for Success not Failure. Within 21 days, it will become your habit to write and speak "I came in this world for success not failure. 3rd Rule. Write and Speak : "It is good when You Face Any Problem." Yesterday, I write a very good content and It read by only 62 people. My Problem is "Why do people not reading my new great content?" I have written in my Notebook : It is good. All People still did not read it. 1. Because still, I did not check it again, it may be spelling or grammar mistakes. 2. Because still, I did not send the message in social media, why should they read this content. 3. Because still, I did not make the next week schedule in social networking for reading this content. 4. Because still, I did not refer it in one month summary to my all subscribers. 5. Because still, I did not make the YouTube video on this. 6. Because still, I did not make its infographics for better understanding of this content. 7. Because still, I did not promote my website in newspapers. 8. Because still, I did not promote my website in all cities of the world through adding posters. 9. Because still, I did not promote my website in school or collage. 10. Because still, I did not promote it online. 11. Because still, I did not thankful from my heart to those who read it. 12. Because still, I did not give the reward to all the persons who read it by writing new free content. 13. Because still, I did not connect with all my fans and readers because I have written only one content after one month. 14. Because still, it is opportunity, I can reach all people with this content and offer to read it. 15. Because still, it is opportunity to add the link of that content in this link because the curiosity of reader will increase now. So, they will read now. Accounting Question is very difficult to solve. It is my problem, I am unable to solve it. 1. Because still, I did not get enrol in Accounting Course. 2. Because still, I did not read all the ebooks of Accounting. 3. Because still, I did not understand the fundamental for solving this question. 4. Because still, I did not try to solve this question. 5. Because still, I did not give more one hour to this question. 6. Because still, I did not focus for solving this question. 7. Because still, I did not thanks to all who have helped me to solve my past questions. 8. Because still, I did not pray of God for solving this question from my heart. 9. Because still, I have to trust on myself that I can solve this difficult question also with new way. 10. Because still, I did not motivate myself for study through self help book. 11. Because still, I did not do exercise and follow naturopathy for becoming healthy. 12. Because still, I did not see the accounting examples for solving this question. 13. Because still, I did not increase my burning desire to solve this question. 14. Because still, I did not set the goal to solve this question. 15. Because still, I have opportunity to solve this question and lead others who are also facing difficulty in this problem. After doing work hard day and night, I am unable to earn Rs. 20 Lakh per month. It is difficult to achieve this goal. This is my biggest problem which gives me negativity all time. As a CA or CPA you have to write in Your Notebook : It is good. I am unable to earn Rs. 20 Lakh per month. It is difficult to achieve this goal. This is my biggest problem which gives me negativity all time. 1. Because still, I did not read marketing eBook. 2. Because still, I did not read this content fully 10 times. 3. Because still, I did not understand the fundamental success in this profession. 4. Because still, I did not try to make better relationship with customers. 5. Because still, I did not give more time for better service than my actual hours of working. 6. Because still, I did not focus for finding new customers. 7. Because still, I did not thanks to all who have helped me to earn what I am earning today . 8. Because still, I did not pray of God for providing better service. 9. Because still, I have to trust on myself that I can achieve this goal. 11. Because still, I did not follow naturopathy for becoming healthy. 12. Because still, I did not make the habit of positive thinking all time. 13. Because still, I did not increase my burning desire to achieve this biggest goal. 14. Because still, I did not promote my identity in whole world. 15. Because still, I have opportunity to earn this amount per month. If I I can dream, I can achieve also this. I did not die. After doing work hard day and night, I am unable to earn Rs. 20 crore per month. It is difficult to achieve this goal. This is my biggest problem which gives me negativity all time. As a businessman or businesswoman you have to write in Your Notebook : It is good. I am unable to earn Rs. 20 crore per month. It is difficult to achieve this goal. This is my biggest problem which gives me negativity all time. 3. Because still, I did not understand the fundamental success in this business. 8. Because still, I did not pray of God for providing better product and service. 14. Because still, I did not promote my business in whole world. This world is the world of negative people. Positive person is one out of one lakh. More than 50000 attack will be negative through your mind's negative thoughts, imagination and emotions. So, buy a blank notebook and start writing and speaking. 1. My mind is speaking to me. Give up accounting education. People is not liking it and reading it. 1. My mind is uneducated in this area. He forgot biggest my achievement in this area. 2. My mind is lazy to do hard work. So, he is giving me negative advice. But, I am not lazy. I will love to write in accounting education even a single person will read my content. 2. My Friend has told me that you did not earn 1% of great film star in your 10 years of hard work. 1. My dear friend, you did not achieve 1% of great film star in your 10 years of hard work. But, I have earn equal love and support from my readers and fans. All film star are the source of my inspiration for their hard work. I did not compare myself with them. I will surely learn all new things which will help me to grow my business. I have also opportunity to learn 99% new ways to achieve 99% more money from film stars. Currency money achievement is very less and self-improvement has all value. My achievement is my all time positivity. Like this, you can also convert all negative energy of your mind, friends, relatives and parents into positive energy through writing and speaking.